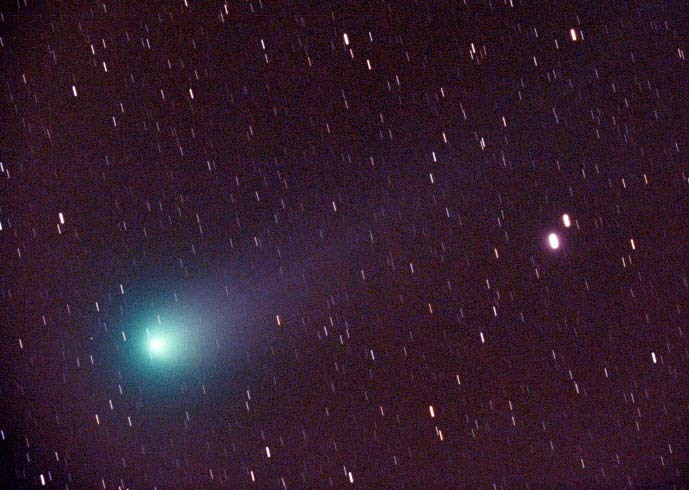 Comet Hyakutake, photographed March 13, 1996 at 1:15 a.m. EST from an observing site near Chatsworth, New Jersey, USA. Taken with an Astro Physic's Starfire 130 EDT triplet refractor at f/6. This image is from a single 30 minute exposure on gas-hypersensitized Fujicolor Super G 800 PLUS. The original negative was scanned and digitally enhanced to produce the image seen here. The exposure was automatically guided with an SBIG ST-4 autoguider on a Losmandy GM 100 EQ mount.